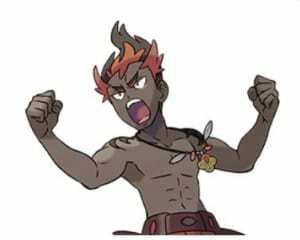 After every 10 battles at the Battle Tree Super Single, Super Double, and Super Multi; there is a chance of encountering Kiawe. The following Pokemon that will be used by Trial Captain Kiawe will be chosen at random. Since no two Pokemon of the same species may enter, only one of the two possible Held Item and move sets will be chosen. The primary concern when dealing with Kiawe’s team is that one of two Pokemon: Talonflame or Salazzle has the possibility of using the held item Focus Sash. Therefore, moves that do multiple-hits such as Rock Blast and Water Shuriken can be helpful in taking them out. Having weather damage to finish off his Pokemon is another option. Another Pokemon to watch out for is his Kangaskhan which always has a Mega Stone equipped. However it can be dealt with by either quickly defeating it with a STAB Fighting-type move; or resort to a Ghost-Type with the ability Levitate and has access to Will-o-Wisp followed by Substitute in order to safely counter a predicted Sucker Punch. Apart from Fighting and Ghost-Types, Kangaskhan cannot do much as it lacks the move Power-Up Punch. This provides Pokemon with high durability such as physically defensive Steel-Types and Rock-Types viable choices, as they can sponge its STAB attacks well for as long as they do not take too much Rock Slide flinches.